When your teeth are damaged the inside of the tooth can become infected. This can then have a bad effect upon the pulp of the tooth, i.e., the blood vessels and nerves inside. If you do nothing about this the infection can begin to damage the bone, causing pain and swelling. If this happens to one of your teeth, come see Dr. Wieland to determine the best endodontic treatment (Root Canal Therapy) to save the tooth. Dr. Wieland may decide to carry out an endodontic treatment (Root Canal Therapy) in order to save the tooth. The doctor will open and remove the damaged pulp and then clean up the inside before putting in a filling and adding a crown. When our teeth are damaged the inside of the tooth can become infected. This can then have a bad effect upon the pulp of the tooth i.e. the blood vessels and nerves inside. If you do nothing about this the infection can begin to damage the bone, causing pain and swelling. If this happens to one of your teeth, Dr. Wieland may decide to carry out an endodontic treatment (Root Canal Therapy) in order to save the tooth. This is referred to as Endodontics due to the words (“endo” – inside and “dont” – tooth). The dentist will open up the tooth, take out the damaged pulp and then clean up the inside before putting in a filling. 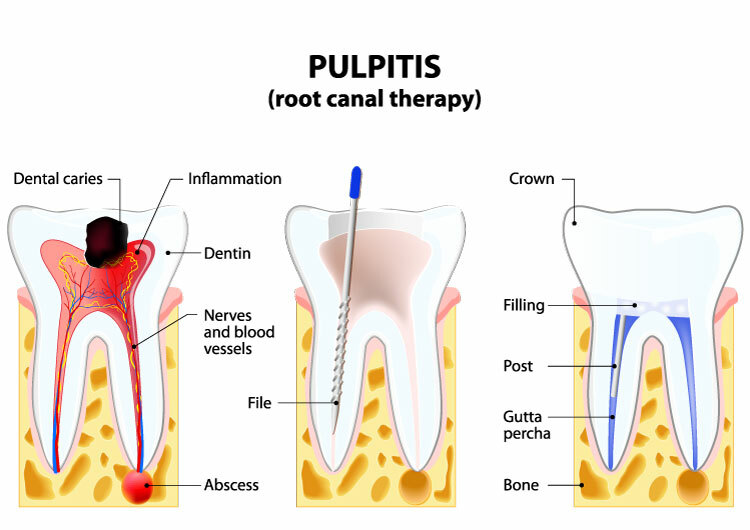 Dr. Wieland may recommend that you have this procedure carried out if the pulp within your tooth is infected or inflamed. This type of damage left untreated can result in deep-down tooth decay and long-term damage. If you suffer from gum disease, this can often lead to root canal problems. If you have this swelling and pressure within your tooth, you will most likely be in pain and infection can result. If you have been suffering with this type of problem for a long time and the issue has become a chronic one, you are likely to be a very good candidate for root canal therapy.